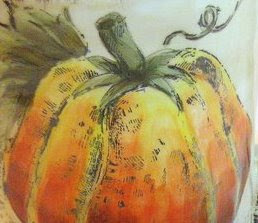 It's All About the Pumpkins . 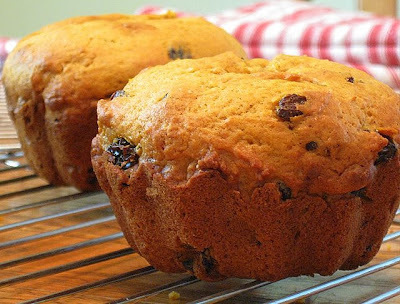 . . and the Pumpkin Raisin Muffins . . . If I received a cupcake for every single time within just this past week that I've either heard, read, or spoken the word "pumpkin," I think I'd have enough inventory to open a bakery. Halloween week really seems to be all about the pumpkins. In light of this fact, how could I not jump on the big, round, bright-orange band wagon? I just had to do it. I jumped right on up there, and the view's very nice, very colorful. I don't think I have ever made pumpkin muffins of any kind before (either that or I just blanked it out of my memory for some reason that's been lost to history), so I was really pleased with the way these turned out. On a whim, I made them in mini-bundt pans, and dog-gone if they don't look even more pumpkin-like than I'd anticipated. You might say these muffins are kind of two-faced. 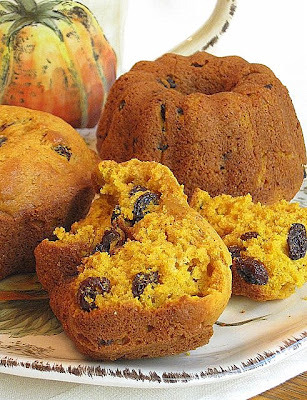 Put them bundt side up and they look like, well, little bundt cakes masquerading as pumpkins. Flip them over and they look pretty much like a nicely convex traditional muffin, with that beautiful golden glow that just seems to scream "October! Falling leaves! Goblins and ghosts! Get out the rake!" (You know the glow I mean? . . . it's a pretty hue, isn't it?). 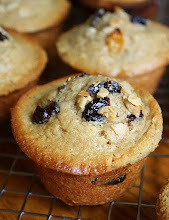 The recipe I used is one I adapted from Elizabeth Alston's little book called, appropriately, Muffins. 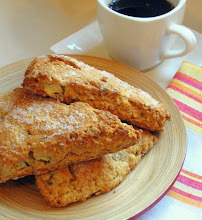 It's one of at least two books she wrote that focus on a nice sampling of breakfast foods, especially breakfast breads (scones, biscuits, etc.). 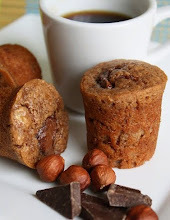 I altered the formula for her pumpkin chocolate-chip muffins. I used raisins instead of chocolate chips, and I changed the spices, leaving out her recommended pumpkin-pie spice entirely. (I don't have any of that, and what's in it anyway? One just never knows.) I used cinnamon, ginger, fresh nutmeg, and a pinch of ground cloves instead--not too much of any one spice. Her recipe also called for almonds, which I've omitted. Oh, and I doubled her recipe and rewrote her instructions. Anyway, it's a really good recipe and I'd definitely use it again. 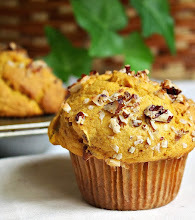 So, without further ado, I offer my own contribution to the ever-enlarging family of pumpkin muffins. Happy Halloween! Preheat oven to 350 degrees. Use baking spray to coat two mini-bundt pans that produce 6 minis each. Or, use a couple of regular muffin pans (for approximately 16 regular size muffins). Use paper or foil muffins cups, or grease the muffin cups well. No mixer is needed for this recipe. In a large bowl, thoroughly combine the flour, sugar, baking powder and soda, spices, and salt. Break the eggs into another bowl and lightly stir them to break them up. Add into that the melted butter, pumpkin, and the raisins. Stir well to completely combine. Make a well in the center of the dry ingredients. Pour the wet ingredients over the dry ingredients in the large bowl. Fold together until everything is just moistened. Don't overmix. Scoop the batter evenly into your pans. Bake for about 20 minutes or so, until golden and a toothpick inserted in the center comes out clean. Turn out onto a rack to cool. Aren't they cute? See, I told you so. Okay, now take a bite of one . . . yummy, yes? Enjoy! Peanut Butter & Jelly Bars, and the Uninvited Guest . . . I'd been working in the kitchen most of the morning, then passing in and out of the kitchen periodically throughout the afternoon. I can't be sure exactly when it happened . . . all I know is that it must have occurred with lightning speed. "It" being the creation of a sizable hole in my kitchen window screen. The culprit? It could only have been a ferocious, peanut-butter lusting tamiasciurus hudsonicus -- a ravenous red squirrel! I see them on a regular basis, peering in, on days when I'm baking with the window opened. A quick swat of the screen, though, has always been enough to disperse the furry fellows . . . but apparently not enough to sway this guy. Doubtless it was a male, and a fine brawny specimen at that, I'd wager. Obviously emboldened by the rapturous scent of my peanut butter & jelly bars cooling on the counter, he made the split-second decision to break in, and so he set to work with his razor-sharp teeth. If I weren't feeling completely merciless, you might very well hear me utter some empathetic drivel like, "Oh, who can blame him? He's just doing what squirrels do naturally . 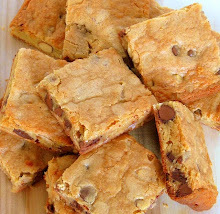 . . afterall, those cookie bars are profoundly irresistible." Hmmm . . .
"Well, m'aam, southeastern Michigan's just full of 'em . . . "
Here's how the pest control company Critter Catchers Inc., according to their website, describes our furry friend, ". . . the most prominent [squirrel] species, that chews holes in roof eves to gain access to a comfortable attic or wall in Oakland County homes." Oh great. My home resides in Oakland County, and I can just imagine what Mr. Red Squirrel has in store for us next. I shudder to think. My advice to Critter Catchers? They should revise their dossier on tamiasciurus hudsonicus, and update their description of the varmint to read as follows: ". . . the most prominent species, that chews holes in roof eves to gain access to a comfortable attic or wall in Oakland County homes . . . this creature will stop at nothing in attempting to gain access to a freshly baked pan of peanut-butter & jelly bars, cooling on a kitchen counter. Residents should be vigilant and be prepared to take all necessary measures." We never laid eyes on each other . . .
Miraculously, though the hole in the window screen was certainly big enough to admit a housecat, it doesn't appear--based on my thorough and exhaustive investigation--that the squirrel actually gained full admittance. My guess is that my approaching footsteps scared him away just as he was about to set foot into the kitchen. He clearly didn't progress beyond the window sill. The peanut butter & jelly bars were blessedly undisturbed and, as you can imagine, I examined them with the human visual-equivalent of an electron microscope before coming to this conclusion. Here's a final message for you squirrels out there: Don't worry, I don't advocate vigilante justice . . . but in this case I'm just not opposed to it. So get this straight--if you're a wild creature, I must insist that you keep your fuzzy carcass OUT OF MY HOUSE! 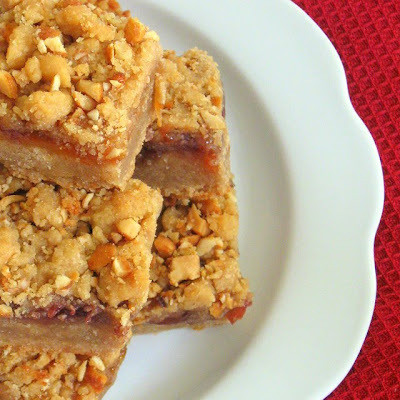 These PB&J bars really are irresistible. I just wish I could resist them. They're a Martha Stewart recipe, from her cookie book that came out about a year ago. 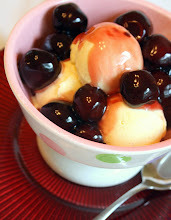 The only aspects of the recipe that I altered were to include three flavors of jam in one pan (I used strawberry, apricot, and seedless raspberry), and to use honey-roasted peanuts instead of plain salted peanuts. Those small adjustments worked spectacularly well. I'd definitely make these again, the same way. Preheat oven to 350 degrees. Butter a 9" x 13" pan, and line it with parchment paper in both directions (length and width). Butter the parchment and dust with flour. In the bowl of a mixer, using the paddle attachment, beat together the butter and sugar until fluffy--about 2 minutes. With the mixer still running, add in the eggs and peanut butter. Mix for about 2 minutes, until combined. Add the dry ingredients into the butter mixture, and beat on low speed until well combined. Add in the vanilla extract. The dough will be quite thick. Transfer two-thirds of the mixture to your prepared pan. Spread the dough out evenly and gently but firmly press it down so it's of relatively even thickness all over. Using a spatula, spread the first half-cup of jam onto one third of the dough, then do the same with the other jams until the whole pan of dough is completely covered. 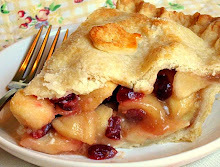 Crumble the remaining dough, that you'd set aside, evenly over the top of the jam. Over that, evenly sprinkle all of the chopped nuts. Bake until golden, for 45 to 60 minutes. If the bars are browning too quickly at any point, cover them lightly with foil. Cool them in the pan on a rack. When they're cool, run a knife around the edges of the pan, and refrigerate the whole thing, uncovered, for about one to two hours. Lift the chilled bars out of the pan by lifting the parchment sheets up. Use a sharp knife to cut the bars into small squares, about 1.5" to 2" in size. Store in an airtight container at room temperature. Makes about three-dozen bars. My Mom (the Conservative Baker) and Banana Sour-Cream Pound Cake . . .
My mom used to make a mean pound cake. She was a woman of conservative taste in most aspects of life, truth be told. This was true of her even when it came to cooking and baking. If she felt a recipe went too far afield, her tendency was always to steer clear. In the almost 46 years that I knew her, she rarely--if ever--made anything remotely exotic. What she did make, though, was usually pretty good and sometimes startingly so. That's not to say she never experimented in the kitchen. Her experiments just didn't appear outwardly adventurous, nor were they necessarily models of house-wifely innovation. They never screamed "Hey, look at me!" (Come to think of it, she never screamed "Hey, look at me!" either.) She had little interest in rocking the culinary boat. You'd never find her poaching an eel or putting pine nuts and pomegranate seeds in the Thanksgiving stuffing, but she was supremely interested in modest conventional variations that could subtly improve upon a recipe that she already really liked. I suppose when it comes to baking, an attitude like that has far more drawbacks than benefits. The one obvious benefit such an attitude might hold, though, would be the fact that it gives you a chance to try and perfect a given recipe through repetition. Sounds kind of boring, doesn't it? I agree that it does. But, I suppose if you're a careful observer of the minutiae of each recipe as you bake, and you care about what you're doing, then a tried and true recipe can seem a bit different every single time you prepare it. I think that's how my mom looked at this kind of thing. She was always trying to see what could be fixed, and trying to come up with ways to not just fix it but to make it better, both in the kitchen and in life. She was often successful that way in the kitchen; outside of the kitchen, however, one just doesn't have all that much control. As she aged, she became more accepting of the things she couldn't change, both large and small, and more appreciative of anything that was truly good . . . in the kitchen and in life. 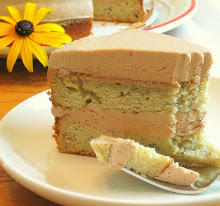 About the banana sour-cream pound cake . 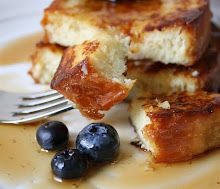 . .
A simple, classic, vanilla flavored, non-boat-rocking, sour-cream pound cake was one of her specialities (for that recipe of hers, click here). The focus of this post, however, is a banana variation of that cake, one that my mother endorsed. It's a nice change from the basic vanilla, but a comfortable change. 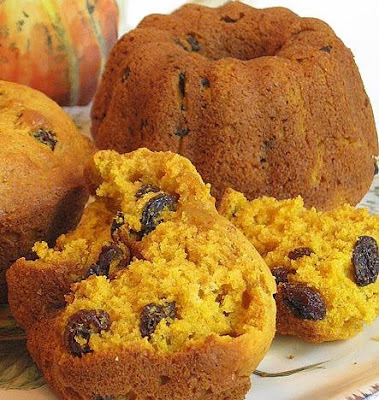 I say kugelhopf, you say gugelhopf . . . I bought a new kugelhopf/gugelhopf pan that I found on sale recently, so I decided to throw caution to the wind this afternoon and bake the cake in that. It's taller, and the bottom of it is narrower, than a typical bundt pan or regular tube pan would be. I don't know if I'd bake this particular recipe in that pan again. The outside of the cake got a little darker than I think it should be, but it is a pretty shape. I've made this recipe before in a regular bundt pan and it's turned out great; I'll probably go back to doing that next time. This is one of those cakes that tastes much better completely cooled than when it's still even lukewarm, and also tastes best the next day. 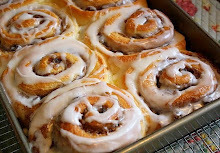 I dusted mine with confectioner's sugar, but in the past I've drizzled it with a vanilla glaze, and I think I gave it a chocolate glaze once too--all delicious options. 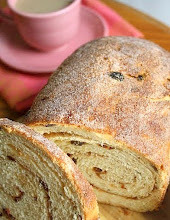 This particular recipe is a slight variation on one that appeared in Taste of Home magazine about five years ago (the original 2004 recipe can be found if you click on the link). 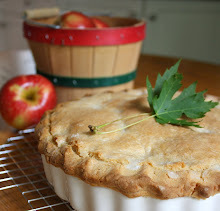 In terms of what I altered: I changed the extract amounts and the salt amount slightly; I used superfine sugar instead of granulated (but feel free to use granulated if you want to); I used cake flour instead of All Purpose; and I didn't use a tablespoon of sugar to "dust" the greased pan. Other than that I left things pretty much the same. Preheat oven to 325 degrees. Grease, or use baking spray on, a 10-cup bundt or tube pan. In a medium bowl, mix together the flour, salt, and baking soda. Set aside. Add the eggs in one at a time, beating well after each addition. Stop and scrape the bowl as needed between additions. On lowest speed, stir in the mashed bananas and the extracts. Continuing on lowest speed, add in the flour mixture and the sour cream alternately. Begin and end with the flour. Stop to scrape down the bowl and the paddle as needed. Spoon the batter into the pan and smooth out the top with your spatula. Bake the cake for at least 65 minutes and even up to 85 (my oven is like a blast furnace; my cake had to come out on the early side). The top should be golden brown and a toothpick inserted in the cake should come out clean. If the top is browning too quickly, cover it lightly with foil. When you deem the cake done, let it cool for about 10 to 15 minutes before you invert it onto a cooling rack. P.S. It can be hard to tell when a pound cake is truly done. I'm notorious for taking them out too soon. That fine velvety texture that's characteristic of perfect pound cake sometimes eludes me because I don't bake them long enough. If your cake comes out too moist, dense, and kind of eggy tasting, it needed to bake longer. This is a live-and-learn lesson, made all the more troublesome if you have an oven that doesn't heat quite accurately (like mine). Apple Cinnamon Bread Pudding with Caramel Sauce . . . Consider yourself in luck! I'm going to spare you my usual gigantic preamble. Really. I am. There's a first time for everything, right? And the caramel sauce formula is a simple adaptation of about six such recipes I've either made or considered making here and there over time. They always seem to be called either "caramel sauce" or "brown-sugar sauce" or "butterscotch sauce" or "brown-sugar butter sauce" or some variation thereof. I think this one tastes more caramel-like than anything else, so that's what we're calling it here, okay? Okay. Your kitchen is going to smell really, really good while this baby's baking. Just warning you. Preheat oven to 325 degrees. Butter a 2-quart shallow casserole dish. Scatter the bread cubes evenly in the casserole dish. Scatter the apple pieces evenly over the bread cubes. Sprinkle one half of the cinnamon and sugar mixture evenly over the top. In a medium bowl, whisk the eggs well. Pour the milk, cream, pinch of salt, and vanilla extract into the bowl and whisk gently until well combined. Add all of the remaining cinnamon-sugar to the liquid, and whisk that in until well combined. 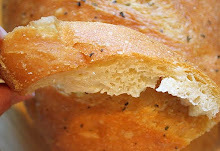 Pour the liquid mixture evenly over the top of the bread and apple pieces. Try to make sure all of the bread gets drenched in liquid. Let the casserole sit for 15 minutes before you put it in the oven; the bread likes to have a chance to soak up some of the liquid. Bake for approximately 45 minutes. The top should be quite golden brown and the middle of the pudding should be a bit wiggly, but not wet looking. In a small saucepan, melt the butter and sugar together over low heat. When the butter's completely melted, while stirring constantly slowly pour in the 1/2 & 1/2, the heavy cream, the corn syrup, and the juice/cider. Still stirring, now over medium-low heat, cook for a couple of minutes, until the mixture looks and feels like the sugar has completely dissolved. Let the sauce cool just a bit before pouring a tablespoon or two on individual servings of the bread pudding. Refrigerate any leftover sauce. The Torte Report: Sacher-Torte, That Is . . . I made a Sacher-Torte yesterday. I'd never made it before. "Oh, that's nice . 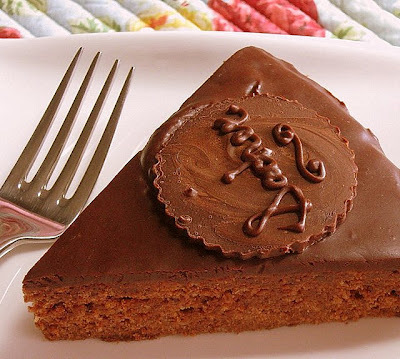 . . but what exactly is Sacher-Torte anyway?" Perhaps you're asking that question . . . if so, it's a good one. I'd never even entertained the thought of making this classic dessert until about a month ago, so I wasn't at all familiar with its particulars myself until just recently. 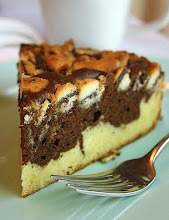 I began reading about this Viennese cake after having chosen it as the subject for a research paper and baking assignment in my cookery class. Now, having wallowed a bit in its history, its preparation process, and quite literally in its ingredients, I can understand the magical effect it apparently had on those aristocratic Austrians who first tasted it in 1832. I can see, unequivocally, that it is not just another pastry. It's been called the world's most famous cake, and it certainly is one of the oldest and most enduring cakes that we know of. Besides having a rich history, which I'll elaborate on a bit in a moment, it's a delightfully adult dessert. Your children won't be clamoring for pieces of this treat, and that's going to be just fine with you since it will mean more for the grown-ups. The bittersweet chocolate in the delicate batter, beautifully echoed in the silky ganache poured over the top, won't bring kids running. It's not sweet enough for them, not colorful enough, not gooey or crunchy or chewy enough. But it's perfect for you. Only a modest slice is needed. A slice that has allowed itself to be cut so perfectly . . . a slice that nestles on its porcelain plate in a subdued fashion, patiently awaiting the soft dollop, or piped curlicue, of unsweetened whipped cream that has traditionally accompanied it for over 175 years. It was, in fact, the Sacher-Torte's very simplicity that made it so popular to begin with, and what a curious beginning it had. It seems astounding to think that a sixteen-year old boy created such a charming and elegant dessert, but that's just what happened. Franz Sacher was an apprentice chef in the kitchen of Prince Metternich, an Austrian State Chancellor, in Vienna. The Prince was known for his demanding nature, and on this particular day he lived up to his reputation, ordering that a brand new dessert be produced under an exceptionally short deadline. Sacher's mentoring chef was not present to take on the task, so the young man did the best he could with what he had on hand. 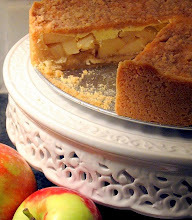 The torte he created was elegantly bare of adornment, relatively speaking, and delicious in its pure simplicity. That was the start of something big. So valued was the Sacher-Torte to Franz's ancestors, as well as to the Viennese public, that it became the object of a 20th-century court case that dragged on for years, having to do with rights of ownership, the originality of the recipe, and so on. Some say it's the only cake that's ever been the subject of litigation. I don't know if that's true, but what a cute claim to fame -- The Cake that Went to Court! Pretty impressive history for a little cake, hmm? I thought so too. It's a lovely dessert, it really is . . . one that would be nice to serve to guests who appreciate confections other than rainbow-colored ice cream, Rice Krispy Treats, and Nutter Butters (though I have nothing, per se, against those whimsical items . . . to each his own . . . as long as you make mine Sacher-torte). Preheat oven to 325 degrees; position a rack in the middle of oven. Grease the bottom and sides of a 9" springform pan. 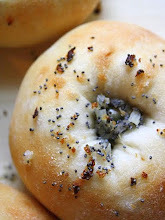 Line the bottom with a parchment paper circle; grease the paper. Put the chocolate in a stainless steel bowl placed over a pot of barely simmering water. Heat the chocolate, stirring frequently, until completely melted. Remove the bowl from the pot and set it aside to cool (I think you'd better not let it cool to anything more than warmish room- temperature--seriously--or you're headed for trouble). In the bowl of an electric mixer, using the paddle attachment, beat the butter at medium-high speed until creamy, for about 1 minute. Add in the confectioners' sugar gradually, and beat on high speed until light, for about 2 minutes. Reduce the speed to medium-low and add the egg yolks in one at a time, beating well after each addition and scraping the sides of the bowl as needed. Add the melted chocolate and the vanilla extract; mix until blended. 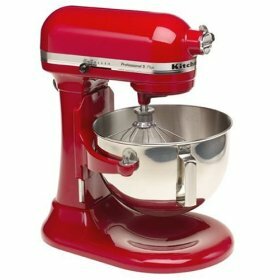 In a separate, clean mixer bowl (it's always at this point in a cake recipe that I thank my lucky stars I have two KitchenAid mixers--one big and one smaller), using the whisk attachment, beat the egg whites with the salt at medium speed until foamy. Add in the cream of tartar and beat at medium-high speed until the whites just begin to form soft peaks. While continuing to beat, add in the superfine sugar one tablespoon at a time, then beat on high speed until medium stiff peaks form. Using a rubber spatula, fold half of the beaten egg whites gently into the chocolate mixture. Sift half of the flour over the batter and fold it in. Sift the remaining flour over that, and fold it in until it's almost but not completely blended. Scrape over the remaining egg whites and gently fold them in until blended. Scrape the batter into your prepared pan and smooth the top. Bake for approximately 40 to 45 minutes (mine baked in just under 35 minutes, but that's to be expected; it's my hyperactive oven), until a toothpick inserted into the center comes out clean. Cool the cake completely in the pan, on a wire rack (don't even loosen the springform until the whole thing is cool--don't cheat here or you might be sorry!). In a small saucepan, combine the preserves and water; cook over medium heat until the mixture begins to bubble; stir constantly! Pour the mixture through a fine sieve into a bowl, pressing it through with a rubber spatula. In the bowl of a food processor, process the chocolate until finely ground. Leave it in the bowl. In a small saucepan, bring the cream to a boil. Remove from the heat and add the ground chocolate to the pan. Stir until the chocolate is completely melted and the glaze is smooth. Stir in the vanilla extract. Transfer the glaze to a small bowl, cover the surface with plastic wrap, and let it cool for about ten minutes; it needs to be a little warmish to pour over the cake, but not too much. Run a thin knife around the edge of the cake pan to loosen it. Carefully remove the side of the pan. Invert the cake onto a cardboard cake round and gently remove the bottom of the pan, as well as the parchment circle. Using a serrated knife, or a cake leveler, cut the cake horizontally into 2 even layers. Handling it carefully so it doesn't break, set the top layer aside. Using a pastry brush, spread one-third of the strained preserves over the bottom layer. Top with the remaining cake layer, and brush it, and the sides of the cake, with the remaining preserves. 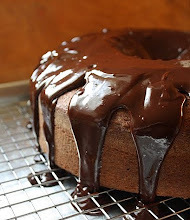 Refrigerate the cake, uncovered, while you make the chocolate glaze. Put the chilled cake, still sitting on its cardboard cake round, on a wire rack set over a baking sheet. If you like, pipe the name "Sacher" on the top. Or, if you're like me and you're hesitant to pipe it directly onto that perfectly smooth surface, make yourself a little chocolate medallion and pipe the word onto that. I took a couple tablespoons of dark chocolate that I'd melted, spread it to about the size of a large cookie on a piece of wax paper laying on a flat plate, and put that in the freezer for no more than five minutes. When it came out, I used a round scallop-edged cookie cutter to cut out a round "medallion" that I then used as the base for my writing. I wrote Sacher in cursive and put a little flourish under the word. The medallion is traditionally placed in an offset position, near the edge of the cake as pictured. That's how they do it at the Hotel Sacher at least (just check their website and you'll see what I mean). Be careful when placing the medallion on the cake, as the chocolate ganache stays soft for quite a while. Ever so delicately, set the medallion on it; don't try to push it in. And voila! You have a splendid Sacher-torte . . . aren't you proud of yourself? I'll bet you can't wait to cut it. Take some pictures of it first, though, and don't forget to serve a little whipped cream next to each plated slice. Your fellow diners will thank you. P.S. Oh, before I forget, I need to note that I left one component out of Tish's recipe, just in order to retain the more traditional nature of the dessert. I did not include a rum and sugar syrup that she brushes on her layers to add moisture. It sounds yummy, but I needed to stay closer to the original version. 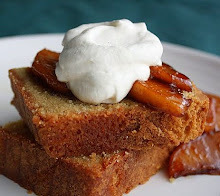 If I were to make this again, I think I might use the rum syrup, or maybe make a similar syrup with Kahlua, and then use raspberry preserves along with that on the cake instead of apricot preserves.